Section 317.24 of the Ohio Revised Code states, that discharge papers for veterans (DD214’s) can be recorded in the Recorder’s Office, at no cost to the veteran. 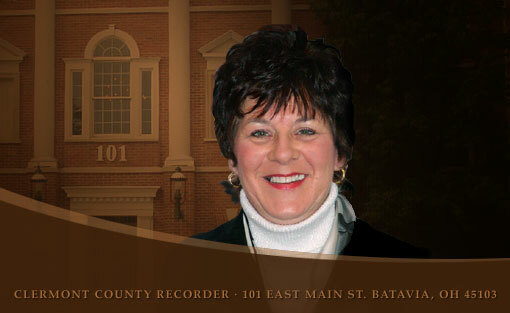 The record will be copied and indexed with the original returned to the veteran. Information on the DD214 will be safeguarded as prescribed by law and be made available at the veteran’s written request, by a certified copy, at no charge.Requests for copies of Discharge Records must be presented in person along with the proper identification. 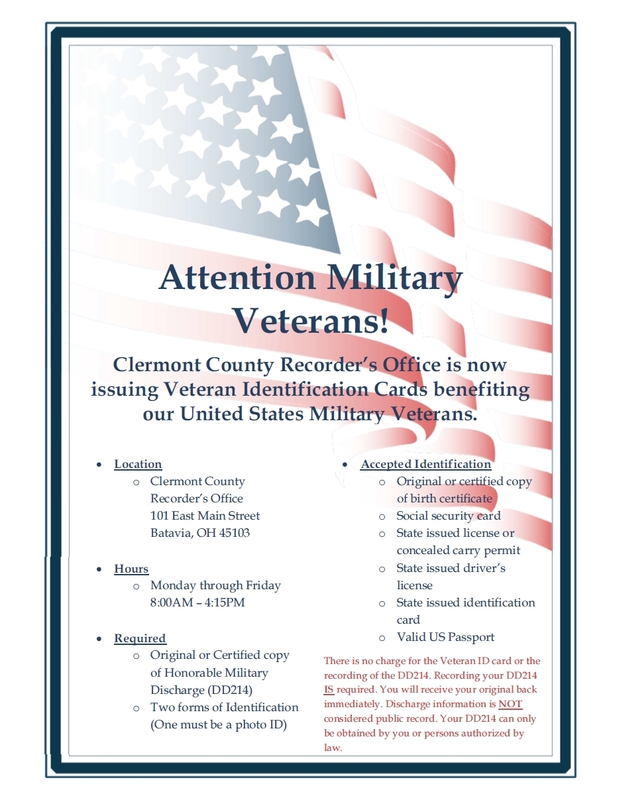 The Clermont County Recorder’s office will provide a request form at the counter or you may download the form by clicking here. Effective April 7, 2009, ORC 317.24 determined veterans discharge records no longer be considered public record. Therefore, only authorized parties are permitted to view or receive a copy of any DD214. The person who is the subject of the record or discharge. A county veterans service officer, or attorney-in fact, agent or other representative of the person who is the subject of the record or discharge, if authorized to inspect or copy the record by the person by power of attorney or other document. A person authorized, for good cause shown, by court of record to inspect or copy the record of discharge. If the veteran of the record of discharge is deceased, the executor or administrator, heir, legatee, or devisee of the veterans’ estate or a funeral director who is to perform the funeral for the deceased veteran. A person other than an authorized party may request to view or receive a copy of the discharge but will view or receive a redacted copy providing only the name, rank, date of birth, date of discharge, and type of discharge of the veteran. The veterans discharge record is not considered a public record for a period of seventy-five years after the date of recording. After that period of time an un-redacted copy may be requested.